When I started putting together the African Undersea Cable Map about 3 years ago, I did it to solve my own problem. I couldn’t make sense of all the news articles about new undersea cable projects and where and when they were and weren’t landing. At the time, all of the cable operators were only interested in publishing maps of their own cable. It seemed an easy task at the time to put the 2 or 3 planned cables on a single map. Little did I imagine that they would mushroom to the variety of African undersea cable projects we see today. As more undersea cable projects were announced the cable map became an increasingly useful reference. As it turned out, I wasn’t the only one trying to keep the various undersea projects straight and the map has become far more popular than I would have ever guessed. But I don’t think it is just the usefulness of the map that has driven its popularity, nor my infographic design skills which are admittedly basic. My theory, for which I have no other evidence than the nature of the feedback I have received from users, is that the map paints a different-from-the-usual picture of Africa. It’s not a picture of a dark continent but rather a brightly lit one, lit by terabits of light capacity brought by a dozen cables landing on sub-Saharan African shores either now or in the near future. Africa, the brilliant continent. This also happens to be the Africa I believe in. 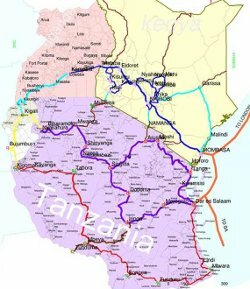 Another thing I think the map has contributed to in a small way is the sense of latent capacity that has inspired investment in national terrestrial infrastructure in Africa. To my knowledge, every country on the continent has some sort of terrestrial fibre infrastructure project either completed or underway to connect to an undersea cable or to a country with an undersea cable. This unprecedented explosion digital infrastructure investment can only be attributed to the sense of the opportunity that the burgeoning African undersea cables represent. But now I find myself with the same problem again, but inland. I keep reading announcements of terrestrial fibre projects in Africa but I can’t keep them straight in my head and few of them seem to publish maps. I feel compelled to once again start pulling this information together into something comprehensible. But mapping terrestrial fibre is a much bigger challenge, lots more cables, and more accurate mapping too. I was a little daunted in taking something of this scope on. That was until Google Africa stepped into the picture. They have kindly offered to help build this map as one of their policy initiatives and to provide some support from their GIS gurus in Nairobi. When complete the map will be hosted by the UbuntuNet Alliance who are working hard to build a high-speed university network linking all African countries. They understand both the importance and the challenge of building cross-border fibre infrastructure. My hope is that when this project is complete that a mayor of a secondary or tertiary city in Africa will be able to look at this map and say, “Hey, we’re only 90 kilometres from the XYZ fibre cable. Let’s talk to XYZ and see how we can set about making our city a regional digital hub. We’ll kickstart local enterprise and make the Internet an integral part of schools in our city.” Or something like that. I hope that a map like this will inspire the same sort of local/regional projects in the way that undersea cables have inspired national fibre projects. Because African Terrestrial Fibre Optic Cable Map is a bit of a mouthful, I’ve shortened it to AfTerFibre. If you’re interested in terrestrial fibre mapping or are an operator of terrestrial fibre in Africa, please come and join us in the Google Group. Together we’ll show the rest of the world how brightly lit Africa already is.